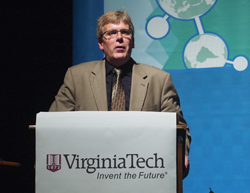 Virginia Tech, the host of Macro2012, recently pledged financial support of USD 10000 to the organizers of the Macro2014 Congress, to be held 6–11 July 2014, in Chaing Mai, Thailand. Timothy E. Long delivering his welcoming speech at Macro2012. Welcoming this gift, Michael Buback, president of the IUPAC Polymer Division, acknowledged Virginia Tech’s lasting appreciation of the international community and IUPAC and stated that the donation will be assigned to a specific activity at the Congress. Details about Macro2014 are online at www.macro2014.com.